Is Worthington haunted? Or just historical? Are there good ghost stories about any Worthington buildings? The Worthington Inn, now there is a roofline that says “spooky tale” to me. Was the Packard Annex haunted? Were there haunted houses there in the 1990s? I think I volunteered to work at one once to work at one once but did not for some reason. Maybe I got sick…. or chickened out? 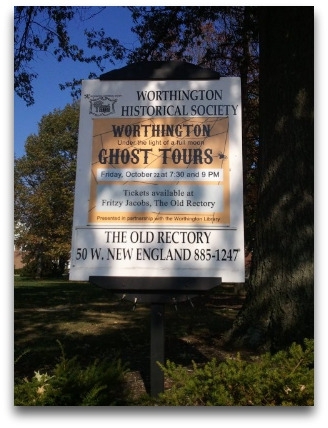 Are there any haunted private residences in Worthington? Worthington is old. Or older than a lot of Central Ohio and a lot of the old is still there… it’s been maintained. Worthington Ohio was settled in 1803. Did Worthington’s ghost “Irwin” run a business out of town? * I thinks since the Kilbourne Building was a library first, there ought to be a haunted library story. Or do haunted stories harm a place? Would a fun scary story hurt or enhance the Kilbourne Building in your opinion?